THE THING (2011): Same Shapeshifter, Different Day – Schlockmania! Some horror reboots are just plain awful and misguided but others fit into a strange category of being earnest, competent yet utterly pointless. 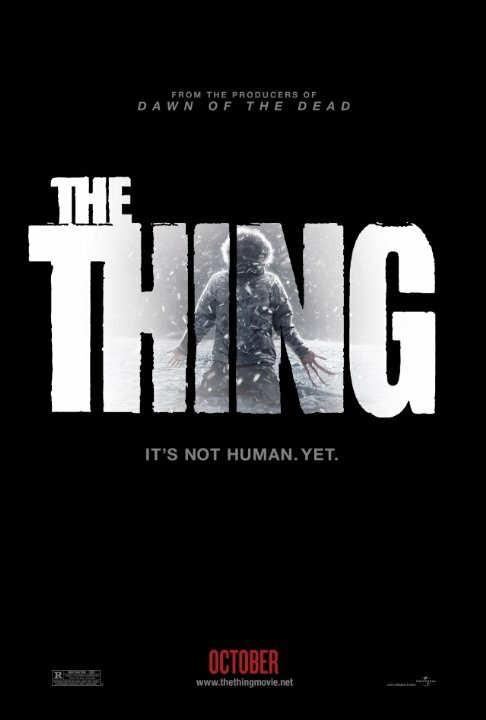 That’s where 2011’s reboot of The Thing belongs It is pitched to viewers as a prequel, complete with an epilogue that directly links it to the opening moments of John Carpenter’s once-reviled, now-beloved 1982 remake. However, it really uses its prequel status as a disguise to recycle most of the best moments of the Carpenter version: its do-it-again template consists of an alien ship discovery, an “awakening” of the alien inside, chases in a facility’s cramped quarters, sudden betrayals by alien-replicated friends, a nervous scene where everyone is tested to determine who is infected, divide-and-conquer paranoia between the survivors and a finale where the last two humans standing square off with the alien foe. The only new wrinkles are the presence of a female amidst the otherwise all-male cast and an extension of the finale that incorporates the alien spaceship in a way that boosts production value while doing nothing of note for the story. Depressingly, the ace makeup effects of the 1982 version are traded for humdrum, intermittently convincing CGI effects. The best element is the cast: Mary Elizabeth Winstead is good as the female lead, Joel Edgerton has fun doing a Kurt Russell impression as the most macho member of the team and Ulrich Thomsen is effective in an otherwise uninspired “alpha-jerk scientist” role. Behind the camera, Matthijs van Heijningen’s direction offers a smooth, chilly approximation of the Carpenter style, minus the sarcastic humor, but the film just marks time with its recycled story beats. The end result doesn’t offend the intelligence but it doesn’t really have a reason to exist beyond recycling a cult property for its parent studio. First of all this is a prequel that follows before the events of Carpenter’s film. Second, The Thing by John Carpenter isn’t a “remake” of the earlier film The Thing from Another World, they are 2 very different films. It’s actually a new adaptation of John W Campbell’s 1938 book Who Goes There, the earlier film had little to do with the source material and kind of took a crap on it. Third, the term reboot needs to go away badly. There are differences between remakes, adaptations and reboots. Reboots are only for things like Batman Begins or Casino Royale (both a franchise reboot and a new adaptation of the book and not a remake of the 1967 film). Remakes are only for films based on films produced earlier with original screenplays (ones not based on any existing source materials like books/novellas/comics) like The Blob or Hills Have eyes. Things like Nightmare on Elm Street and Halloween aren’t “reboots” they are remakes and aren’t like Batman Begins where BB does a completely different take. You clearly have great passion for your own opinions but that doesn’t make them facts. This film is a stealth reboot disguised as a prequel – and yes, the Nightmare On Elm Street and Halloween remakes are indeed reboots because they are rebooting a franchise.